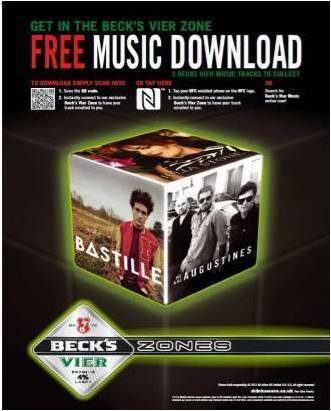 Becks have just run an on-trade music promotion for Becks Vier in pubs and bars in London, Birmingham, Newcastle and Leeds. The campaign allowed consumers to interact with a Becks Vier Beermat or A3 washroom panel using NFC, QR codes or a unique search term in order to be directed to a Becks Vier microsite. Once there, they could chose 1 of 3 tracks from upcoming artists, and enter their email address to have the track sent to them. The Campaign with Admedia was planned and bought by Vizeum and Posterscope.